Our KC department has just completed a detailed benchmark of fixed line and wireline broadband providers in Latin America and I wanted to share some interesting figures of Colombia, one of the countries were we started our professional consulting adventure and were most of us lived during the start-up launch of the third mobile operator in the country. 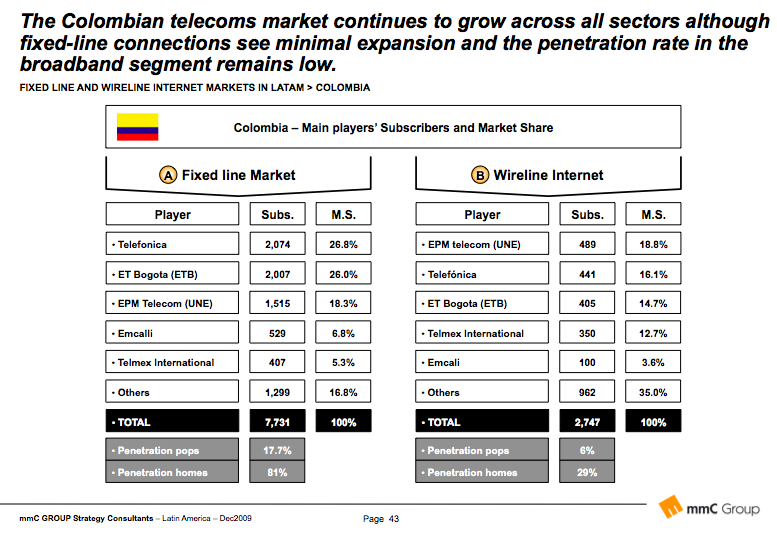 As of the 3rd quarter of 2009, the Colombian telecoms market continues to grow across all sectors although fixed-line connections see minimal expansion and the penetration rate in the broadband segment remains low. Nonetheless, there are considerable opportunities for operators in these two markets. Colombian operators have been keen to offer bundled services with IPTV launches from at least two municipal operators in 2008. Certainly dual and triple play services will play a key roll in ensuring there is not a sharp decline in fixed-line connections. Data from the CRT, the telecoms regulator, indicates that broadband subscriptions are not only growing but average download speeds are also increasing. As content available over the Internet needs ever increasing bandwidth to be run, the demand for faster Internet connections will continue to rise. Colombia’ s broadband market sees few subscriptions over 1Mbps, and improving networks will be a key area of development to push further growth. With strong competition in the market, prices should fall, allowing more subscribers to gain access to networks. In this update we have concentrated on the fixed-line and broadband markets with regional breakdowns provided highlighting how rural areas are yet to be reached in most of the countries. In the Colombian case, Bogotá accounts for the largest number of fixed lines and broadband connections in Colombia followed by other major cities. For the market to continue to grow, networks will need to be expanded into rural areas to gain access to new subscribers. The mobile data analysis has remained largely unchanged owing to this fixed-line and broadband focus although forecasts have been fully updated. Case you need any further details about this benchmark feel free to contact me!.